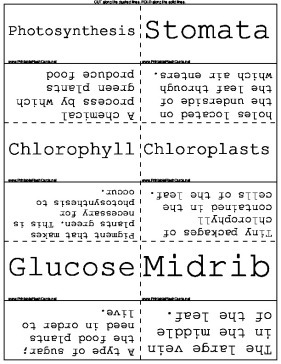 Biology students can learn about plant structure with these printable science flash cards. 1. Print out the cards. 2. Cut along the dashed lines. 3. Fold along the solid lines. Stomata holes located on the underside of the leaf through which air enters. Chlorophyll Pigment that makes plants green. This is necessary for photosynthesis to occur. Chloroplasts Tiny packages of chlorophyll contained in the cells of the leaf. Glucose A type of sugar; the food plants need in order to live. Midrib The large vein in the middle of the leaf. Cuticle the waxy covering that coats the skin of the leaf and prevents water from escaping. Shoot System The part of the plant that is visible above the ground. Root System The part of the plant that is below the ground. Taproot One main root that goes deep into the ground. Root Cap A layer of tough protective cells that cover the end of the root. Root Hairs Tiny projections near the end of a root that absorbs water and dissolved minerals from the soil. Guard Cells A pair of cells that surrounds each stoma on a leaf to control how much water evaporates through the stomata. Cellulose A tough, fibrous material manufactured by plant cells out of glucose and used to make cell walls. Tropism The growth of a plant in response to a condition in its environment, such as gravity, water, light, or touch. Perennial A type of plant that does not die after one season but lives for many years. Annuals Plants that live for only one year. Biennials Plants that live for two years. Dendrologist A scientist that studies trees. Cambium Layer The part of a tree's trunk where growth takes place. Annual Growth Ring An inner band of light spring wood and an outer band of dark summer wood that make up one year's growth of a tree. Deciduous Tree A tree that loses its leaves in the fall. Evergreen A tree that keeps its leaves year round. Spores Single cells produced instead of seeds in some plants. Rhizoids A fern's roots that grow downward from the underside of the stem. Fronds Leaves of a palm tree or a fern. Kelp A kind of brown alga that is the largest type of alga. Saprophytes Fungi that feed on dead matter. Mycelium A network of cells strung together in a threadlike structure that makes up the main part of a fungus. Hyphae Tiny, white, hairlike structures of a mold. Hydrotropism A plant's response to water. Phototropism A plant's response to light. Thigmotropism A plant's response to touch. Fruit Anything that forms from the ovary of a flower. 3 parts of a seed 1. Embryo - miniature undeveloped plant. 2. Cotyledons - contain stored food for growing plant. 3. Seed Coat - covers and protects embryo. Botanist Scientist who studies plants. Filaments Long strings of cells laid end to end. Parasites An organism that gets its nourishment by attaching itself to another organism and continuously taking in that organism's body fluid. Classification The process of arranging things into groups according to their similarities. These flash cards are available as a free download, Just download it, open it in Acrobat Reader (or another program that can display the PDF file format,) and print. Or you can instantly create your own custom flash cards for free. If you don't see a flash card set or category that you want, please take a moment to let us know what you are looking for.